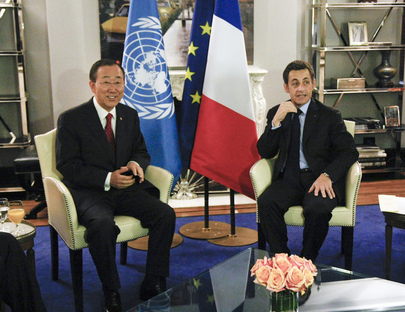 UNITED NATIONS, February 16, updated twice -- As France tries at the UN to pitch the upcoming G-20, there is more than a little grumbling, met by a lack of transparency. Amid news of French ministers accepting vacations and transportation from dictators and their associates, French diplomats descend on the UN General Assembly and its president seeking, they say, the “legitimacy of the G-192” and of democracy. Last week in the UN's North Lawn building, France's Permanent Representative Gerard Araud emerged from meeting with GA President Joseph Deiss of Switzerland, only to make snarky jokes to a Swiss diplomat sitting in the relocated Vienna cafe. Araud not having had a Press availability in months, Inner City Press sent questions about the meeting to the spokesman for PGA Deiss, as well as to the French Mission to the UN's spokesmen. In fact, the Swiss have complained about France not inviting them to the G-20, while inviting among other non-members Ethiopia and Equatorial Guinea -- some jokes, could a junket in Malabo be far behind? While dismissed as unrelated to the G-20, Sarkozy and his ministers including Chrisine Lagarde are loudly beating the drum for Florence Cassez, convicted of kidnapping in Mexico. (Ms. Lagarde says she will bring up l'affaire Cassez at the upcoming meeting of G-20 finance ministers). France derides the Mexican legal system and ask that Ms. Cassez be sent back to Paris to serve out her sentence. But what ever happened to the those returned from Chad to France from L'Arche de Zoe, also accused of kidnapping? The French Mission does not make it easy to get answers, even for Francophone non-French. Why did France abstain from the Security Council's Iraq resolution -- most say “BNP” -- and what will happen next? What is France's thinking of deferring the International Criminal Court's prosecution of Sudan's Omar al Bashir? And, as relates to “its” G-20, how will France pass the G-20 torch to Mexico 2012, while so deriding its legal system? Watch this site. Update of 6:10 pm -- the French Mission has responded that while the l'Arche de Zoe staff were returned to France in December 2007, their sentences of hard labor being converted to imprisonment, on March 2008 Idriss Deby of Chad granted pardons and they were released. Inner City Press asked, and asks, where are they now? But answers are appreciated - including by Mr. Le Maire about the G-20. Watch this site. Update 2 - it is explained that Equatorial Guinea was invited as head of the AU, and Ethiopia for its role in NEPAD. UNITED NATIONS, February 11 -- The UN Security Council's daylong debate on peace, security and development ended in discord Friday night with Georgia accusing Russia of ethnic cleansing, and Russia's Permanent Representative Vitaly Churkin calling Georgia's president a criminal. Not waiting for this right of reply time at the end, Costa Rica's foreign minister told Inner City Press at the stakeout about his country's attempt to get land back from Nicaragua. A copy of his statement was promised, but before it arrived Nicaraguan diplomats told Inner City Press of the land, it's ours, we're not leaving. Inner City Press asked Colombia's foreign minister about human rights violations and the killing of union organizers. We will crack down on crime, she said, turning to questions about Egypt. We'd like to hear more from Council member Colombia. Ten hours earlier it had begun with so much promise, with a concept paper drafted by the Council's president for February Brazil, whose foreign minister met with his G-4 counterparts from India, Germany and Japan to push to get permanent seats on the Council. Inner City Press: having looked at the index of the document prepared by Amb. Tanin, the membership seems divided, at least on the issue of categories. Can you respond to the idea that there's still no agreement? What steps will you take? Westerwelle. I mean the main issue is exactly what Foreign Minister Krishna said. ... What we agreed last year before, that we want to have a restart, to use the opportunity now to reform the Security Council, to reform the United Nations, is the main message we can send now. This is the point. And I would like to add something to my opening remarks. 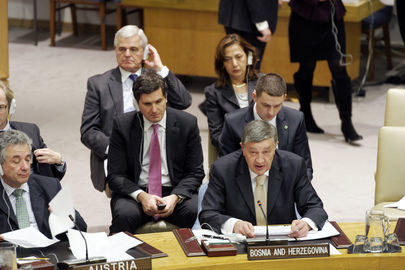 It is not only the fact that 3 of us are at the moment members of the Security Council. It is also a lucky coincidence that heavyweights like South Africa and Nigeria are now also members of the Security Council. And this opens new opportunities and these opportunities is what we'd like to use. ... I underlined that we think it is not just in our national interest, what we are doing here. The idea is, if the United Nations will not reflect the world like it is in our days, the authority of the United Nations will decrease, and because we want to have a strong United Nations, a successful United Nations, with authority in the world, we think it's necessary to reform this worldwide working organization. Working? By the time Russia and Georgia faced off, there was not a single person in the public gallery to watch. Inner City Press was escorted up to the photo booths, most of which were locked. Only UN TV was filming. Churkin left the chamber before Georgia's sur-reply. His seat was taken by Konstantin Dolgov, who Inner City Press is told will be leaving his deputy post at the UN, the end of an era. In the audience was Sri Lanka's Permanent Representative Palitha Kohona, who began by joining in the statement of the Ambassador of Mubarak, or Egypt, Maged Abdelaziz. Maged had refused to answer the Press' questions, running out of the General Assembly. It was another day on which the news of the world was only peripheral to the words at the UN. In the Council during the week, the Magritte phrase was used, “These are not just words.” But aren't they? The Council will meet on Thai - Cambodia on Monday. Watch this site.